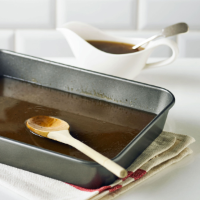 This method for making gravy is simple and can be used with any meat you are roasting. Place the roasting tin with the fat and up to 200ml meat juices on the hob and bring to a simmer. With a wooden spoon, stir in the flour and incorporate all those tasty, sticky bits on the bottom of the tin. Cook for 1-2 minutes, stirring continuously, before gradually adding any remaining meat juices and enough hot stock to make 500ml gravy. Bring to the boil over a medium heat and stir constantly until thickened. Stir in the port or red wine, if using, and redcurrant jelly. Season to taste and serve in a warm jug.